The high desert town of Bend Oregon is blessed with a mighty volcanic peak, Mt Bachelor. Surprisingly Bend also hosts a strong surfing and ocean-loving community. In an excerpt from the SRF Mission statement, Bend local, Gerry Lopez, explains, “Even though the sea is Yin and the mountains Yang, a person can seek and find a balance of harmony while enjoying both worlds.” We are glad to enjoy that balanced life with him. Last Friday evening several dozen lucky yogis met at Groove Yoga Bend for a 90 minute yin yoga class with Gerry. Every teacher at Groove is uniquely gifted, but there’s no doubt that Gerry’s life experience and commitment to his practice provide a treasured experience. As Gerry encouraged us to allow the postures move into our bodies, rather than pushing our bodies into postures, we had plenty to focus on as we held poses for … a very long time! Gerry encouraged our focus on breath and allowing thoughts to simply pass through. As we moved toward the balance yin yoga can provide, Gerry’s calm narrative taught us much about the yin and yang of yoga, life and – even surfing. During one segment of pigeon, my wandering mind overcame every attempt at focusing on breathing. I tried to imagine the calm yin one could experience while surfing even while a wave might be a swirling of yang surrounding. The iconic images we’ve seen of Gerry’s elegant and super-cool style on a wave flashed through my mind. Within the yang power and seeming chaos of a wave, Gerry is a dot of calm yin a midst it all. 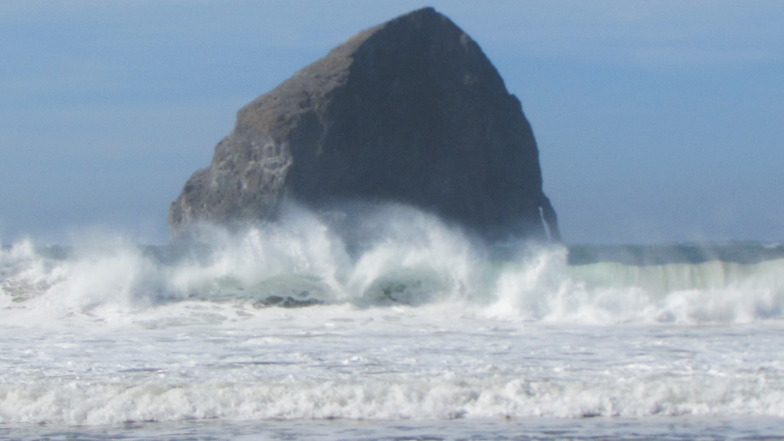 Folded in pigeon pose, my wave images flashed back to wonderful surfing trips at Oregon’s Pacific City. “Breathe, be the yin within the ride,” I said to myself. A few images sprang to mind. At first it was that fear-panic that arose trying to paddle out in short interval, fast moving whitewater. Slowly images morphed into those blue-sky-sunny-glassy day rides that soothe the soul. Am I a dot of yin among that whirling yang? Over time in that pigeon I could feel my breath flow into my skiing-punished knee and a tight hip. Breathe in, allow the breath to flow where tightness resides, breathe out and allow relaxation and lengthening. The long time in the posture was like a long time underwater after a washing machine wipeout. Fighting it doesn’t help at all. Allowing a yin sense of calm and focus to drive thoughts and action/inaction opens the door to what we seek – AIR! BALANCE! CALM! Just like agitation or fear can creep in during a yoga posture, we react similarly in life. Maybe the next time life – or the surf – throws a scary set your way you can do what you do on the mat. Allow your breath to calm you. Take time to see where fear or resistance resides. Find a way to discover patterns and order amid the chaos. This entry was posted in Journeys and Quests, People and tagged Bend Oregon, Dennis Oliphant, elder sup, Gerry, Gerry Lopez, Groove Yoga bend, kiwanda, Oregon, pacific city, Sun Country, Surfing, Yin yoga, Yin-Yang, Yoga by Water Words. Bookmark the permalink. Very nice post + feature on Jerry. He has mastered many things & continues to inspire. Love that video too!